Money Dashboard is launching a new tool to create a digital mortgage journey. TrueView™ offers an instant assessment of a consumer’s ability to afford a mortgage, by aggregating and organising financial transactions from online accounts and mapping them to mortgage lenders’ criteria. The innovative nature of the offering has seen it taken into the FCA’s Sandbox for live testing. The FCA Sandbox is part of Project Innovate, an initiative launched in 2014 to provide new innovations with support to navigate the regulatory system, and promote competition in the interest of consumers. Applying for a mortgage is still a painfully offline, paper-based process. According to research conducted by GBG, an estimated 65% of consumers no longer receive paper bank statements and 42% do not hold paper copies of utility bills, resulting in a 3 hour document collection process. The whole process is so stressful that 35% of buyers are made ill by it, and according to research by Aldermore, the top consumer priority to alleviate this problem is simplification of the customer journey. The start of a borrower’s journey is equally difficult. Research by Money Dashboard found that 76% of consumers take over 2 years to prepare for a mortgage. Contrary to expectations, it is only in the final 3 months prior to applying for a mortgage was there any significant increase in activity to financially prepare or seek advice from a broker or lender. The preceding 21 months were occupied almost exclusively online with trying to understand how various different product and information providers might be able to help them. Money Dashboard’s TrueView™ solution instantly aggregates & organises income and expenditure data from all online current accounts, savings accounts and credit cards, giving a unique bespoke assessment of what a consumer can afford based upon lender criteria. It replaces nervous consumer ‘guesstimates’ and potentially unfavourable models with an impartial and accurate view of their financial position. Consumers can use the tool to both plan for and improve their affordability, and when they are ready use the assessment and data to apply for a mortgage. The app replaces fact-finds, affordability assessments and bank statement collection. Verified data can be directly accepted by brokers and lenders to support a digital mortgage application making applications digital, simple and transparent. 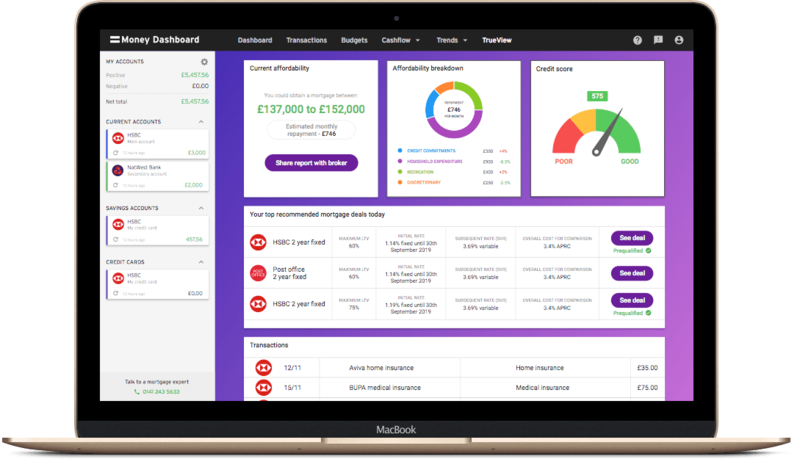 TrueView represents the latest evolution to Money Dashboard’s affordability tool, which was in beta last summer and formally launched at The Council of Mortgage Lender’s inaugural digitisation conference in October 2016.